While the focus of this blog to date has largely been on jewellery making in Florence, I think it’s high time I dedicated an entire post to our Bologna base. There is a saying in Ireland, ‘It would be a great little country if you could roof it’. The town planners at home could do worse than take a leaf out of Bologna’s book in this regard. The porticoes here mean you can get about in the rain without an umbrella! Hurrah! I’ve been told that Italians from outside Bologna tend to moan about the unpredictable weather here. Apparently proximity to the Apennines is to blame for the capricious climate. But Bologna’s propensity for precipitation isn’t really a problem. There are about 40 kilometres of porticoes in the city and they have been sheltering the inhabitants from rain and sun since the Middle Ages. However, roofing the pavements wasn’t a deliberate decision based on the weather here. 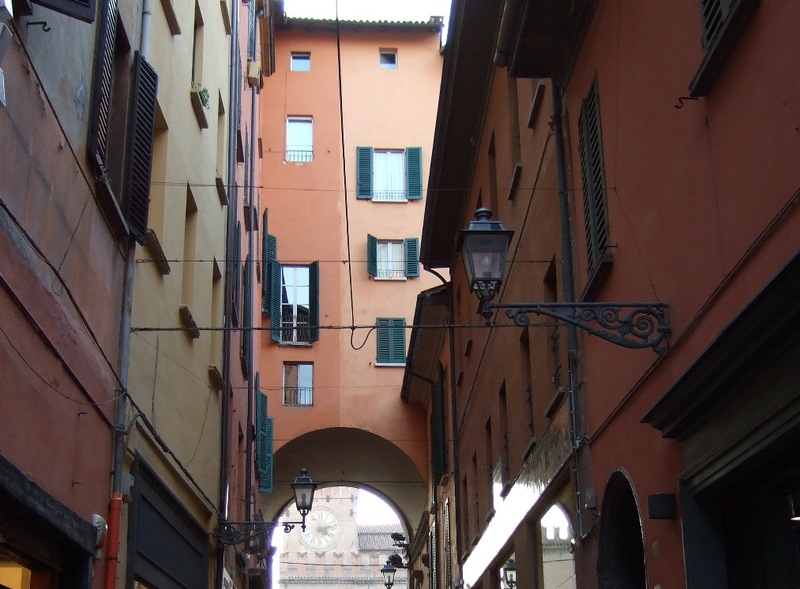 According to the tourist board of Emilia Romagna it came about because of a demand for student housing, and people extending the upper floors of their homes over the public areas below. It was essentially a public land grab by private home-owners, but it has made Bologna incredibly beautiful and atmospheric, even in the rain. You feel welcomed by this particular architectural feature, as if the city wants you to be comfortable here. My only gripe about Bologna’s weather is that it has on occasion made me look sartorially clueless in Florence. Sometimes I have left here in the morning in a downpour, dressed appropriately in my boots and waterproof jacket. I have then arrived in Florence to glorious sunshine, and had to plod about in my big boots while everyone else was flashing their ankles in sock-less All-Stars and turned up jeans. The differences between Bologna and Florence extend well beyond the meteorological. The wealth and cultural-heavyweight status of Florence is evident everywhere you look, with swarms of tourists pouring through the streets, photographing every cinematic vignette. Bologna has plenty to shout about culturally too, but the city is more understated, feeling more like a no-nonsense, working town going about its everyday business. It’s home to the oldest university in the world (founded in 1088), and has a much less conspicuous tourist population than Florence. As a result I feel slightly less inclined to break out my camera, because there are no crowds of snap-happy out-of-towners to provide camouflage. Although sometimes unusual situations can arise and loosen the grip of occasional scopophobia. One Sunday in November, myself and Ollie somehow wandered into a protest at Piazza Maggiore and couldn’t get out of the square thanks to the police barricades. So we just took photos of the riot police instead until we could leave, and luckily missed out on the skull-cracking that ensued. We later discovered it was a protest against the far-right Lega Nord leader Matteo Salvini, so were happy to have accidentally made up the numbers. Mostly though, our Sundays in Bologna are a lot more relaxed than that. Riot police, Piazza Maggiore, Bologna. In my meanderings off the main thoroughfares, down the little side streets, I sometimes feel like I have stepped cleanly into the past. There are no people, traffic or signs of modern life. Whenever this happens, I wonder if the view before me has changed at all in the past ten or twenty generations. My daydreaming is inevitably interrupted by the abrupt emergence of a moped roaring down a passageway so narrow that the pillion passenger could probably touch the powdery cinnamon walls on both sides if they fully extended their arms. Aside from people-watching and wandering through the porticoes, I only recently got to know a bit more about Bologna, despite the fact that we are living here since September. A few weeks ago I decided to take in some of the sights around town. 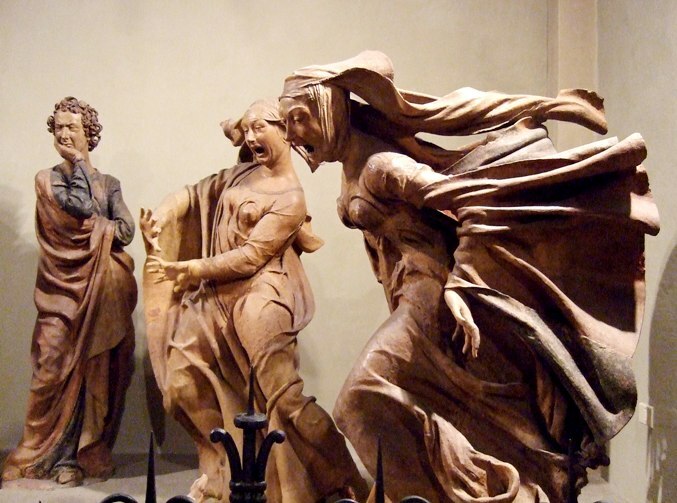 The fifteenth-century terracotta statues in the Sanctuary of Santa Maria della Vita were recommended to me by my London friend Chris during the first week that we arrived, but I still hadn’t gotten around to seeing them with all my dashing to and from Florence. They comprise a group of figures, titled Compianto sul Cristo morto (Lamentation over the dead Christ) by Niccolò dell’Arca. It is a powerful piece of work. 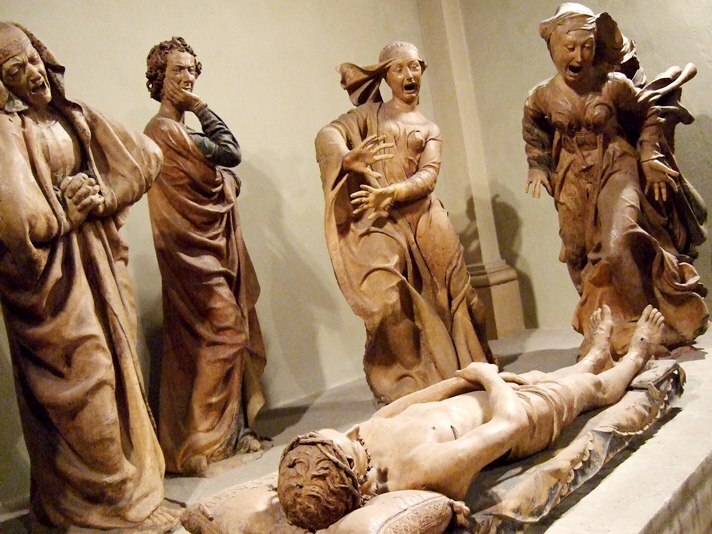 The sculptor is said to have visited the nearby hospital to observe the suffering of its occupants and transferred their agony into the clay figures. This may sound incredibly exploitative but it turned out to be to the benefit of future patients. The cult of devotion which sprung up around the sculptural group consequently generated enough revenue to pay for the upkeep of the sanctuary and the running of the hospital. 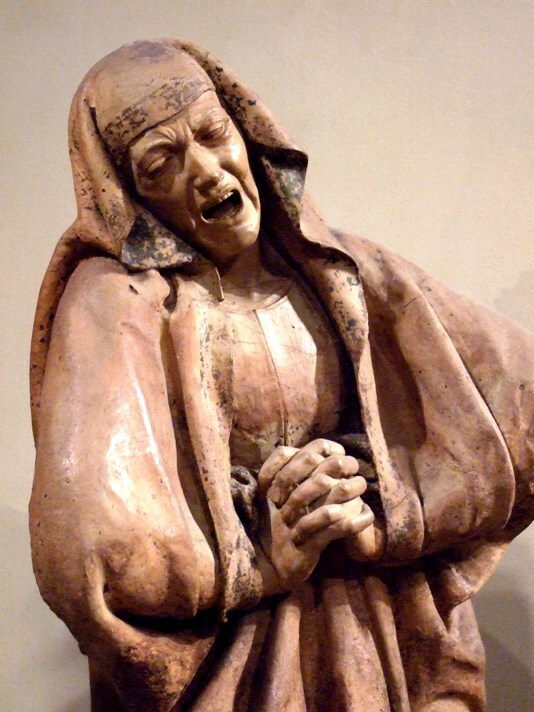 Little did the suffering patients who inspired dell’Arca think that their anguish could still have such power centuries later. When I had finished appreciating the pained expressions of the sculptures, the elderly woman who had checked my ticket told me to go upstairs to see the impressive oratory, which was also housing a photography exhibition by Pierre Gonnord. Such serendipity! I could have stayed there all day, again staring at the faces before me. But these were in stark contrast to the anguished faces downstairs in the church. These expressions were mostly placid and weary – it was evident that they had been forged by the living of hard lives. They were the expressions of miners from Asturias and Castilla y León in Spain, covered in coal dust, and despite their dirty appearance they emanated dignity. The accompanying film, which showed the miners standing in front of the camera waiting to be photographed, was incredibly moving. It had been speeded up, and their increased breathing rate made it appear as if they were panting. They were making efforts to wipe some of the dirt off their faces with their sleeves and the exertion of their days work was clear. The variety of their facial features, hair texture and eye colour seemed to be accentuated by the coal dust. It heightened their uniqueness. Some of them looked like meerkats with their accidental eyeliner. Some of them looked like an Old Master could have painted them. At the end of the shift …Armando, 2009, © Pierre Gonnord. You can read more from Woods on the miners here. Perhaps my default urge to always fight for the underdog owes something to growing up amongst people who don’t take things lying down. As Woods has done with his writing, Gonnord has managed to immortalise the miners in his exhibition and do their story some justice. Their striking portraits will stay with me. And I now feel compelled to visit Arigna on one of my visits home. I left the darkness of the exhibition and exited back onto Via Clavature to the bustle of window shoppers and cheerful café staff. The buildings in their various shades of orange were vivid and uplifting, even as the daylight began to fade. I turned left around the corner and wandered down the street, and soon caught sight of an inviting courtyard. I had discovered the Palazzo dell’Archiginnasio, which I have learnt was the first unified seat of the university. The internal porticoes are beautiful and serene. The walls and ceilings are covered in frescoes and reliefs of coats of arms, indicating the origins of distinguished past students, and this continues inside the building until it appears that nearly every available space has been used. There is an anatomical theatre in the building, originally built in 1636, almost completely destroyed during WW2 and faithfully restored, with the inclusion of as many original features as possible. A large marble table for candlelit dissections has centre stage and the room is adorned with wooden sculptures and busts of great physicians throughout the ages. Two skinless humans are also depicted in wood, flanking the chair of the teaching professor. It occurred to me that a mere accident of birth separates those toiling unseen in a dark tunnel, from those immortalised on a university wall for hundreds of years. I always appreciate what I have, but I felt especially fortunate on that day. Not only to have stumbled upon Gonnord’s incredible exhibition and the Palazzo dell’Archiginnasio, but to be in this historic city, in this fascinating country, and getting the chance to train in something I love. I felt a greater impetus to make every remaining day count. Time is passing too fast though, and I already feel a bit sad at the thought of leaving Bologna so soon. I’ve barely scratched the surface of this place, and I am so grateful for the experiences I’ve had already. Thanks for loving my country so much!